bạn Upset Zoey!. 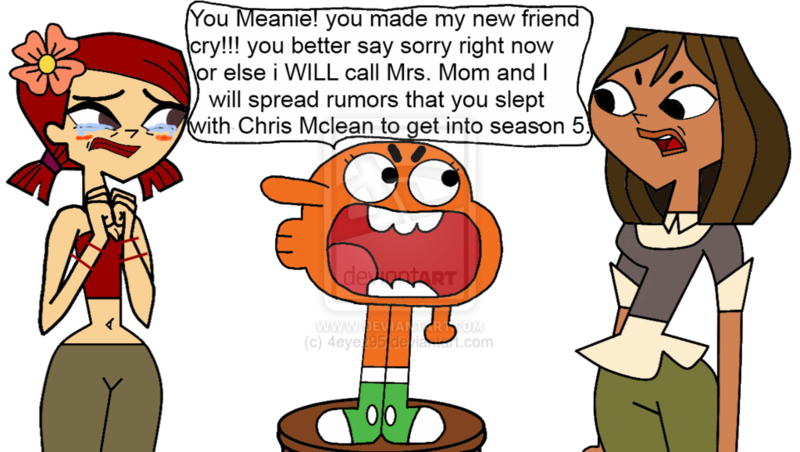 Things would be spectacular if Trent was Brian Griffin in "Family Guy", since he told Connie off on her popularity.. HD Wallpaper and background images in the Total Drama Island club tagged: photo. Zoey was never "hurt" from Courtney. Ohh, poor Zoey. Poor girl who gets far in BOTH seasons she was in BARELY trying, almost EVERYTHING handed to her. Poor, POOR Mary-Sue Zoey with the biggest fan base out of all the TDROTI cast. ^You're misunderstanding the context of the art. It's fan-made. IT'S FAN MADE?! OH MY GOD! YOU BLEW MY MIND! SHUT UP!!!! KEEP THE COMMENTS TO YOURSELF!!! I LIKE ZOEY CAUSE OF HER COMMANDO! I COULD SAY I HATE MIKE AND LIGHTNING! ( I accually LOVE mike, Lightning can just go to the nether though. ) IT MAY HURT SOMEONE'S FEELINGS!!! SO JUST SHUT UP!!! ^ You do realize "Commando" means "naked", right? Seriously, it isn't ment to be taken literally. You can tell due to the giant fish standing on the bar stoll that it was just made for laughs, and honestly, I found it quite amusing. Love the posts on these one image is just soo funny! Hahaha! @DandC: Zoebo (A portmanteau of Zoey and Rambo) would be a more APPROPRIATE term.